All in all, it was a painless five minutes. Even so, there were two things I didn't like, and one thing that would have made it go a lot smoother. Well, that was certainly anti-climactic. My wife and I are busy these days, so when the census forms came earlier in the year, they simply went on "the list" and have remained there, buried under some random pile of papers on a desk somewhere in the house. 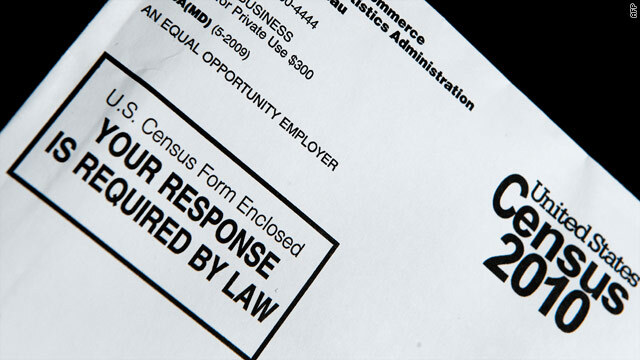 Unlike Minnesota Republican Representative Michele Bachmann, who worried that the census would be "very intricate" and "very personal", we had no political reason to ignore the forms. We just had lots of items on our to-do list. As it is wont to do, time passed. Days turned into weeks and weeks into months, and we still didn't fill out the forms. So, yesterday, the doorbell rang. It was...(cue ominous music)...the Census Taker. His name was Paul and he was surprisingly nice, dressed in slacks and a button-down shirt. When I say Paul was surprisingly nice, you need to understand that here was a guy - one of a few hundred thousand with a very short-term gig - who had to knock on the doors of strangers' houses. Anything could be on the other side. And he had to do it for what's not exactly the best salary in the world. Worse, he had to greet me and smile. That's a tough gig. When I'm writing on a deadline, I'm a scruffy grouch. I tend to wear sweat pants and a T-shirt, my hair points in all directions (yes, I do shower), I have a dark, black beard, and I'm weight-lifter large. Plus, I growl. In the face of all this, Census Taker Paul gave me a pleasant smile, showed me his ID, and asked if he could ask a few questions...(cue ominous music)...a few intricate, personal questions. He asked how many people lived in our house. He asked our names. He asked for our birth dates, but was not even slightly upset when I declined to give him that information. I don't give out my birth date - it's one of the easiest ways someone can get into your personal data and carry out identity theft. That was pretty much it. Paul didn't ask how many slaves we owned (a question mandated in the earliest American census). He didn't ask about sexual proclivities (as often as possible, thank you!). He didn't ask Windows or Mac (both). He didn't even ask chocolate or vanilla (chocolate, vanilla is a blight upon mankind). The first thing I didn't like was Paul hadn't been issued a photo ID. He'd been issued a census taker ID, but it didn't have a picture on it. In these crazy days, that's a big mistake and I encourage the Census Bureau to fix before 2020. Paul also asked for our birth dates. I talked before about identity theft, and I'm not thrilled that hundreds of thousands of just-previously unemployed individuals are getting that information. Finally, the one thing that would have made the experience oh-so-much better is this: Would it have hurt the United States government to equip Paul with coffee and donuts? I mean, if he knocked on the door offering a cup of coffee and a box of donuts, I'm telling you, that would have been neighborly. Next time, instead of giving billions to AIG and Goldman Sachs, just give every census shirker coffee and donuts. What? I can dream, can't I?